Are Dryer Sheets Dangerous? Is Fabric Softener Toxic? Deep down, I do wonder if we’d be buying tons and tons of this stuff, if it was a lethal toxic hazard. But, we’ve been duped before. One way I try to prevent exposure to toxins is to ask this question: “Is there something else that works as good or better, and is cheaper and/or easier?” Many times, there is something else you can do that is both cheaper and easier and works better. 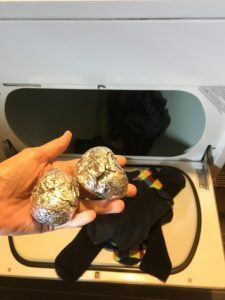 Toss them in your dryer, and leave them there for six months to a year. You will not need to add fabric softener to the wash, or a dryer sheet to the dryer ever again. Let me know how it goes, people! I want to hear about it; and please share any other tips that help people cut down on chemicals by posting your suggestions below, in the comments. Thank you!